Quarterbacks Eli Manning (10) and Aaron Rodgers (12) headline one of wildcard weekend's more intriguing match ups in terms of divisional strength. 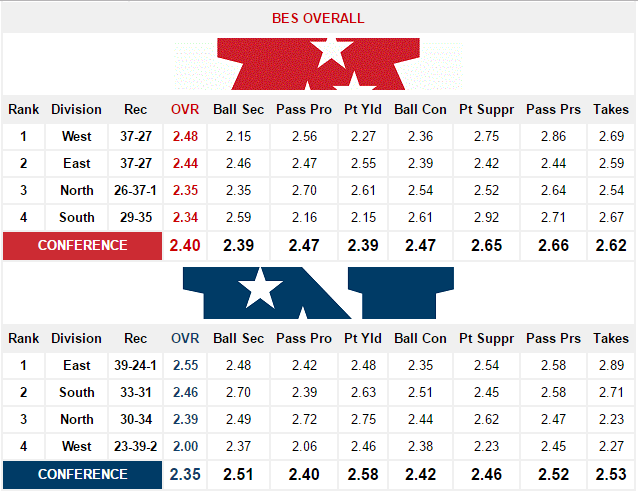 The most immediate difference in this report compared to our initial midseason divisional rankings is a complete shift in power between the conferences with the AFC now owning the higher BES Overall score of the two. Still, some things remained the same as the AFC West was again narrowly edged out of the lead by the NFC East. Compared to our midseason report, the balance of power in both conferences is more evenly distributed among the divisions which might hint at some rather interesting outcomes in the playoffs. One such game where an argument for legitimacy of NFL divisional strength could be made is the wildcard round match up between the Raiders (12-4) and the Texans (9-7). 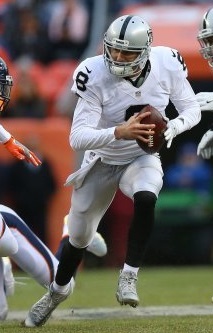 On the surface, the fact that the Raiders will start rookie QB Connor Cook on the road against the No. 4 BES Defense tilts this game in favor of the Texans. However, the Raiders fell just one game shy of clinching the conference-leading AFC West and ranked slightly higher than the Texans in our final 32-team report. Additionally, Cook has some big-game pedigree from his collegiate career at Michigan State where he led the Spartans to multiple Big-Ten Championships. Lastly, the Raiders defense is ranked No. 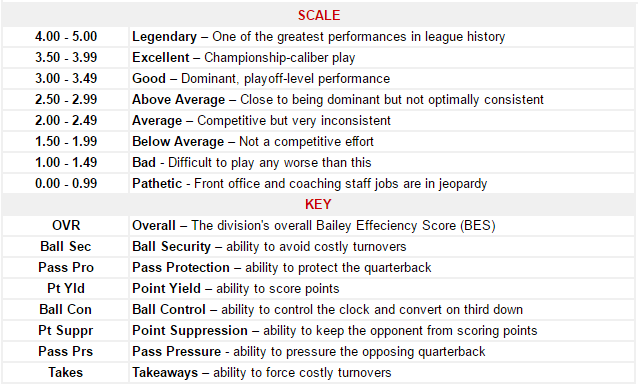 9 by the BES and owns a 3.80 Takeaways score versus a Texans offense ranked 27th with a Ball Security score of 2.28. This could mean more scoring opportunities for the Raiders No. 9 BES Offense and Cook who will likely be emboldened by his first full week of practice reps as the starter. Basically, though it seems unlikely, don’t be shocked if Cook leads the Raiders to a win. Another wildcard match up that intrigues due to divisional strength is the Giants (11-5) visit to the Packers (10-6). The Giants hail from the embattled NFC East and were the only team to conquer the Cowboys in a competitive game (The Cowboys, having already clinched the NFC’s No. 1 seed, benched key starters in a 27-13 loss to the Eagles in Week 17). That’s something the Packers couldn’t achieve in Week 6 when they fell to the Cowboys at home 30-16. It’s easy to favor the Packers in this contest as they are one of the hottest teams in the tournament, ranking No. 3 in BES Overall which is the highest among NFC teams. They also possess the No. 1 BES Offense complimented by the No. 11 BES Defense. Above all else, they have a formidable home field advantage at Lambeau Field where they bested the Giants 23-16 in Week 5. Nevertheless, under quarterback Aaron Rodgers the Packers are 0-2 when hosting a wildcard game. Additionally, Giants quarterback Eli Manning owns a 37-20 divisional round victory at Lambeau in 2011 when he led the team to a victory in Super Bowl 46. Therefore, the Giants defeating the Packers and advancing to the divisional should surprise few. Not sure where you people are getting your opinions from…..The AFC West IS the toughest division in football. The Giants are a fraud and they have Dallas. That’s it! !